Ever wondered what the best solar shed lights are? Flipped through fliers and scrolled pages of internet stores? You’re not alone! They all look good, but what should you be looking for in solar lighting for sheds? With the old incandescent lights, it was watts; the more power, the more light. With solar lights, you want to look for how many LEDs it has, how many lumens it produces, and how many lux it will illuminate. You also want to consider what you are illuminating your shed for and if you want it for inside or outside your shed. How long the solar light needs to be on, switch or motion sensor, inside or out? If it’s so you don’t bang your head on something, or to read by, or light up your path, then there are different options. So many questions and choices! In this article, I’ll attempt to provide you with what you need to know so you can buy the best solar shed light. What are Solar Lights and How They Work? Read How Long do Batteries Hold a Charge? 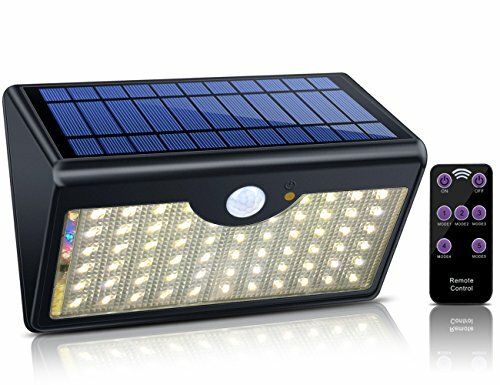 Do Solar Lights Need Sun or just Light? Do Solar Lights Work on a Cloudy Day? Do Solar Panels Ever Wear Out? Solar lights operate using about 23% of the sun’s reachable energy that a solar photovoltaic panel collects and converts to electricity. The photovoltaic cells are made of silicone and use photons in the sun’s light to produce energy. Artificial light can also be used with a photovoltaic panel to charge batteries, provided the light be bright enough. The solar panel works best in full sunlight but is still 40% effective when it is cloudy. Solar cells work more efficiently in cooler temperatures. For every degree above 77°F, the cell produces ¼ of a percent less energy. So, hot sunny summer days aren’t the best days to produce energy. However, winter in much of the northern 50° of latitude means shorter days and more clouds, so less sunlight and charging time. The converted solar energy is stored in rechargeable batteries for use when the sunlight isn’t available. The batteries can be lithium, lead-acid, nickel cadmium, or nickel metal hydride. A charge controller prevents the battery from being overcharged or over discharged and protects it during temperature extremes. It also controls the light, a timer, sound, an AC transfer switch, and reverse polarity protection. Some lights also have an inverter, which is converts direct current (DC) to alternating current (AC). A look at how a photovoltaic cell takes the sun’s light and turns it into energy we can store and use is like a walk in the park…blindfolded; in other words, it’s not as easy as it sounds. A photovoltaic cell is made of two thin silicon plates. The top plate has some phosphorus added creating a negative charge with extra electrons. The bottom layer has some boron added to create a positive charge and fewer electrons. The two layers combine to make an electric field between them similar to a battery. When the sun’s protons pass through the thin top plate, they pick up free electrons creating an electric current between the layers. The electron-enriched proton is pushed to the outside of the cell to conductive plates and then transferred to a wire where it flows as electrical current. A solar panel is made up of many photovoltaic cells to produce energy from the sun. The more sun, the more energy the cells produce. Your shed is too far from the house or another power source. You don’t wish to add to your utility bill. It’s too expensive or difficult to bring electricity to your shed. These are just a few of the many reasons to choose solar light for a shed; below are some more reasons. Once manufactured, solar lights are an eco-friendly alternative to provide light in your storage shed. They convert the sun’s light into electricity, so they don’t add to your monthly utility bill. They are a cost-effective way to illuminate your shed vs bringing electricity to power conventional light fixtures. Solar lights are also low maintenance. They use rechargeable batteries to store electricity, and to power the LED lights and can last for 7 or more years before needing to be replaced. One final reason is the variety of styles available. There are hundreds of different types and styles of solar lights on the market. There are two basic types of solar lights for sheds; the integrated solar panel and the separated panel. Both use the sun to produce energy, but each delivers light differently. 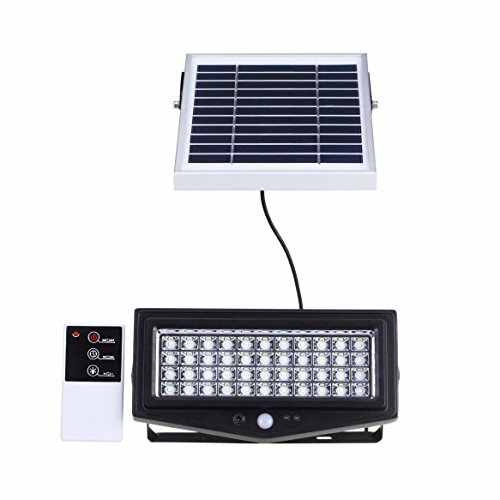 An integrated solar panel is a waterproof light fixture that includes a panel, LED array, rechargeable batteries, and a controller. To control how and when they provide illumination, most have a light sensor, a motion detector with sensitivity adjustment, a brightness switch, and some also have an on-off switch. While the integrated panel can be used inside a shed, the photovoltaic panel needs to receive the sun’s light to charge. It works best for security shed lighting and to illuminate paths and doors. A separate solar panel has two or more individual components. 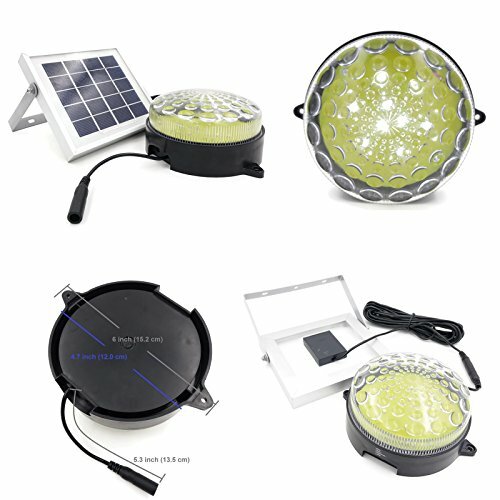 The waterproof panel, which converts the sun’s light to electricity, is connected by a detachable cable to an LED light fixture that houses the rechargeable batteries and controller. The fixture (waterproof or not) usually has a light sensor, on-off switch, and some have a brightness switch and motion detector with a sensitivity adjustment. The separate components make this an ideal system for illuminating the inside of your shed. The panel is mounted outside to optimize solar energy conversion and the fixture inside where it is most effective. If all components are waterproof, then the LED fixture can also be mounted outside to provide illumination and/or security where you want it. Motion sensors are used to detect movement by projecting an infrared light or microwaves. When something or someone enters the scanned area, they trip the sensor and activate a light for security or to illuminate a path or area when in use. The sensors are also used to optimize the potential of solar-powered LED lights, so they aren’t on all night and drain the batteries of stored energy. Passive Infrared (PIR): senses infrared radiation projected by the heat humans or animals emit within its range. The emitted radiation disturbs the “normal” temperature analysis grid and triggers the sensor. Microwave (MW): uses microwave pulses to measure the distance between it and stationary objects in its field. An object entering the field will send a different reflection and trigger the light or alarm. They cover a broader field than the PIR and are the most common. Dual Technology Motion Sensors: contain two types of sensors that combine the features and reduce false alarms. Both sensors must be triggered for the light or alarm to be activated. It can still have false alarms. Area Reflective Type: Monitors a given area using the reflection of an emitted infrared LED to measure the distance to objects in its field. It is triggered when something gets too close. Motion Sensor Light Placement: Place the sensor in an area people have to pass by, a “choke-point” – for example between gate posts or hedge openings. Many sensors can detect motion up to 80 feet away, so aim them where they won’t pick up traffic or your neighbor. Sensors also work best if something or someone walks parallel to it, not straight on, so mount the sensor beside the path, not at the end. Motion sensors may have false alarms, to minimize the frequency ensure you follow the manufacturer’s instructions. Animals, insects, foliage and even snowflakes and heavy rain can trip a sensor, use the “sensitivity” setting (if it has one) to prevent this from occurring. The amount of light you want in your shed depends on what you need it for, and the size of your shed. If you only need enough light to move around and find large items, you’ll need less than if you have a workbench that requires more light. The more illumination you want, the more lumens you’ll need. A small shed will require less light than a bigger one which may need two or more fixtures. For task lighting over a workbench or something similar, use a solar dot light. They focus light and provide illumination similar to a 40-watt incandescent bulb. Some have motion sensors, which shut the light off to save power – could be a pro or a con. Another issue to consider is how long the light will be needed. During the day the batteries are charging. If your shed is dim and not dark, the light sensor on the solar fixture may not allow the light to switch on. If the light is only required in the dark as a security light or to illuminate a doorway to insert a key, then a motion sensor on the fixture will help maintain the charge. If you want the light to stay on all night, then you’ll need to look for fixtures rated for more extended run time. They use less power by producing less light, so are decorative instead of task oriented. To calculate your lighting requirements, look at lumens and not watts. Lumens are the measure of the total amount of visible light produced. The greater the number of lumens, the more light produced. Watts measure the amount of power a light uses. Another measure that is now being included on packaging and light descriptions is lux. Lux is the amount of light produced by one lumen in a square yard. Multiply the area to be illuminated (in square yards) by the number of lumens recommended for a task, and you will have the total lumens you need. An integrated solar panel needs about 8 hours of sunlight to charge the batteries, so it needs to be where it will get the sun’s light. An LED fixture with a separate panel can go in an area that receives little light, while its panel can be located in full sunlight. Choose the type of solar panel that best suits your region. If you get lots of cloudy days or have a yard full of trees, you may need to consider installing a larger photovoltaic panel where it will get the most sunlight; possibly on the roof. The panel can be wired to charge multiple lights or a battery storage system that will then provide power for the lights when needed. The size of the panel and battery depend on how many lumens you need in your lighting system. To determine how long a battery holds a charge, read about the solar light you plan to purchase. Consider also reading any reviews available for battery information. The next generation of batteries, or top-line batteries, usually holds a charge up to 2½ times longer than older batteries. The number of LEDs in a fixture influences the amount of illumination it will produce. The more it has the better. Some have 3 to 6, others up to 16, and still others up to 24 or more. The information should be on the package. Modern lights don’t need to stay on all night until they drain the batteries dry. The information on the packaging should identify if the light is motion activated, pull cord, remote or has a light sensor for dusk-to-dawn lights. To save battery power, look for models that have motion sensors, an on/off switch, duration timer or adjustment, or brightness control. If it has a light sensor, make sure it is on the fixture. Some lights will only work when the panel isn’t receiving sunlight; so not functional during daylight even if the shed is dark. 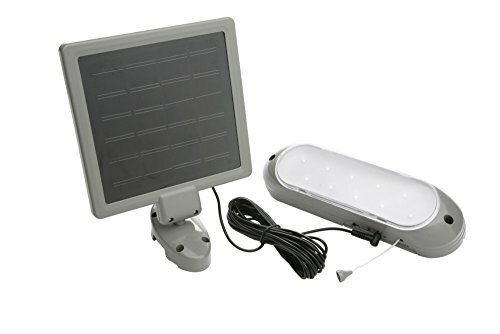 A wall mounted solar light with a separate panel that can attach to the roof, a pole, or on an outside wall to receive as much sunlight as possible is a great shed light. Most are long lasting and rated between 30,000 and 100,000 hours of LED illumination. Make sure the mounting base of the solar panel permits angling in more than one direction. The wall-mounted light that I recommend is the Woods Designers Edge L-949 Shed Light. The panel connects to the LED fixture with a detachable 16-foot cable for easy installation. This solar powered shed light includes 10 LEDs that provide 30 lumens; enough to brighten an 8×12 shed, but not enough to light up a workbench. To extend battery life, this fixture has two light modes, full bright or ½ bright with only 5 LEDs activated. At ½ bright the batteries will last twice as long. An on/off switch is also important as it allows you to control when the light is on, and for how long. The placement of the LED fixture is important. Place it so that you aren’t standing between it and what you are looking for. It can also be mounted on the ceiling if that works better for you. 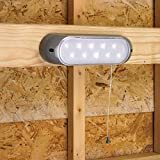 A hanging multifunctional solar-powered LED light with a detachable solar panel is a great way to illuminate different areas of your shed. My recommendation is the LightMe Multi-functional LED Solar Powered Light. The hook allows it to be placed in multiple locations to improve lighting where needed. The panel mounts outside where it requires 8 or more hours of exposure to sunlight, and plugs into the fixture using the supplied cable to charge a lithium-ion battery. The 12 LEDs emit up to 140 lumens to brighten the whole shed, or to provide a more concentrated task light. It has multiple brightness modes, so you have more options on how bright you want it, and also to conserve battery life between charges. The LightMe Multi-functional LED Solar Powered Light comes with a remote control to change the brightness and turn the light on or off so you don’t have to reach to operate it. 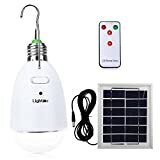 The multifunctional aspect of this light allows it to be used as a solar-powered light, or with the flick of a switch to AC; it can be screwed into a light socket to charge and operate as a normal LED bulbs. Should a power outage occur, just flick the switch to DC, and it runs for up to 12 hours on the battery. Use it in one location, or move it around to where you need it. It can then be connected to the panel and recharged if the power isn’t back on. Solar light with a more focused beam and which produce a high number of lumens, 150 or more, is excellent task light. The narrower beam concentrates the light in a more localized area creating greater illumination. The ROXY-G2 Solar Outdoor/Indoor Lighting Kit is the product I’d recommend. The solar panel requires 8 to 10 hours of sunlight to charge the 2400mAh rechargeable battery. It connects to the light fixture with the 16-foot detachable cable. The fixture has an on/off switch, multiple brightness settings, and a light sensor so will only work when dark. If you leave it on, it will act as a nightlight after dark until the battery is drained. 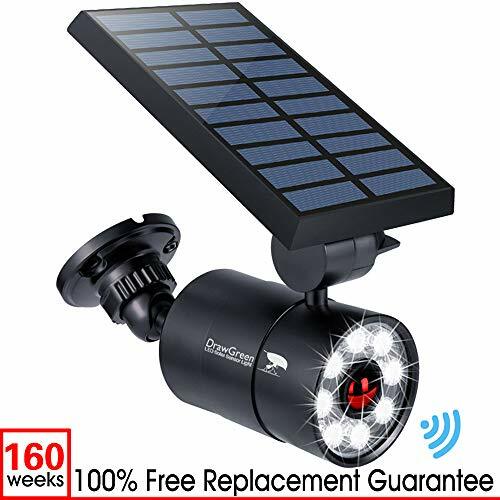 Solar powered shed security lights are a great way to light up a path or an area at night without the expense of hardwiring electric lights. Illuminating your yard and home can also deter burglars and animals that prefer dark and shadowed areas. They can also be used indoors to illuminate the whole shed, or for a workbench task light. When selecting a security light, look for one that provides 90 degrees or more of light, has a dual motion sensor to reduce false detections, multiple brightness settings, a light sensor, and an on/off switch with time adjustment. It should be able to illuminate a minimum of a 20-foot by 20-foot area and have enough battery storage to last 6 to 10 hours on a continuous setting. 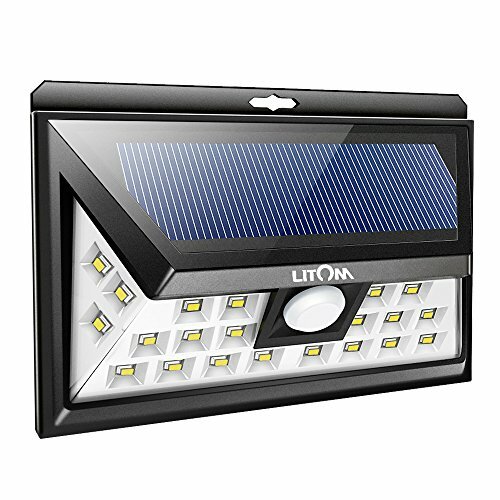 The integrated solar powered security light I’d recommend is the easy to install Litom Outdoor Solar Light with Motion Sensor. The waterproof fixture is a multi-directional 3 sided light that illuminates a wide 270-degree area when motion is detected. The motion sensor detects movement up to 26 feet away at a 120-degree angle and activates the light for 20 seconds, but will keep it on until it no longer senses motion. The light can be set in the all-night mode for continual use. There are 3 settings for the 24 LEDs which provide up to 420 lumens of luminosity. 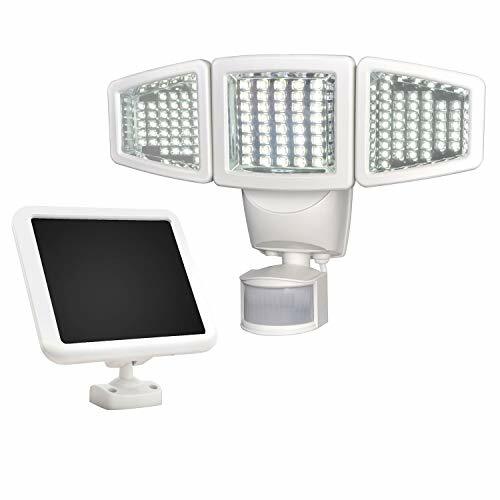 The separated solar powered security light that I’d use is the Sunforce 82123 120-LED Triple Head Solar Motion Light. The waterproof plastic fixture provides a super bright 1000 Lumens coupled with a 180-degree wide 30-foot detection range. The 3 heads are independently adjustable to better provide wide 30’ by 20’ (or more) illumination where needed. The solar panel connects to the light with the detachable 15-foot cable and doesn’t require direct sunlight when charging the 3-AA rechargeable batteries, even on cloudy days. The light has a photovoltaic sensor so it will only come on at night; it also has adjustable light and detection settings. Lights that use a photocell automatically turn on at dusk and off at dawn and are a great way to light doorways and paths without adding to the electric bill. They provide a welcoming glow to friends, visitors, and a deterrent to thieves and critters. My preference is the photocell activated MicroSolar dusk to dawn solar flood light. The 108 LEDs produce 400 lumens of natural white light focused in a 60-degree beam. 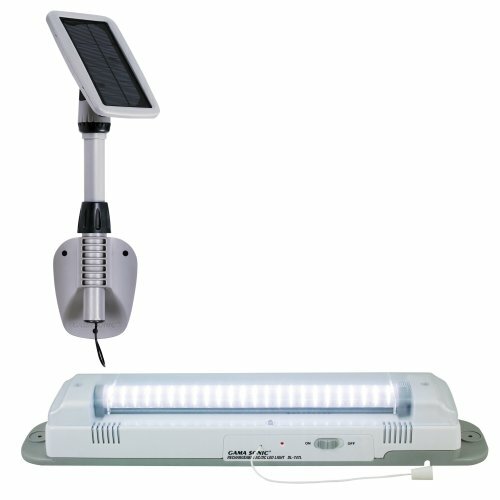 A 4000mAh lithium battery provides 8 – 12 hours of power when fully charged by the aluminum solar panel which connects to the LED lamp with a 16.4-foot removable cable; allowing flexible installation. The batteries are replaceable and are located on the back of the panel. If necessary, you can override the photocell by using the on/off switch on the back of the panel. Solar light with a pull cord is ideal for inside a shed. It allows you to turn the light on or off as needed. The pull cord also means it can be mounted higher on the wall or ceiling to provide better lighting. 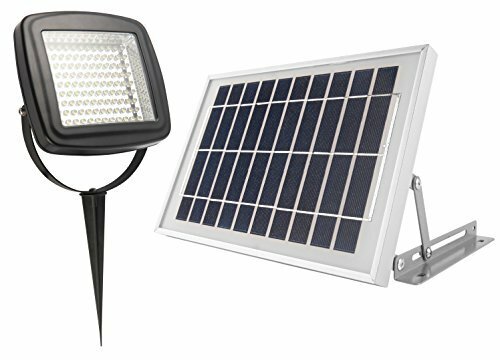 The Gama Sonic Light My Shed III Solar LED Light Fixture is my preference for a solar light with a pull cord. 48 LEDs produce a bright 400 lumens which will light up most sheds. To conserve battery power, you can switch to 24 LEDs with less luminosity. The multi-adjustable aluminum solar panel mount ensures you can access full sunlight to charge the batteries. The 10-foot cord means the panel and light can be placed to optimize the conversion of sunlight to the LED light. It even has a built-in nightlight so you can find the cord in the dark. A remote-controlled shed solar light is a great option for providing light at the push of a button. It can be mounted out of reach and still allow you to remotely modify the settings without pulling out the ladder or standing on a chair. Tera Light manufactures a 44 LED solar security flood light with a motion sensor and remote control which would be my first choice. The 1000 lumen light can be mounted indoors or out to illuminate a shed interior or a path. The 4 long-lasting 2000mAh lithium batteries provide plenty of power and can be easily replaced if necessary. The aluminum panel connects to the light with a 12-foot cable so accessing full sunlight shouldn’t be an issue. The lamp has an on/off button and a motion sensor too. Use the remote control to adjust the brightness setting, set the timer button for 1 or 2 hours, or turn it on or off. Alternatively, just let the motion sensor take over; it will turn into a dusk-to-dawn light using 50% luminosity but provide 100% light for 30 seconds when it detects movement. Installing a 2’x4’ solar panel or two on your roof or a frame to maximize exposure to the sun may be a good alternative to installing multiple mini-solar panels or running power to your shed. Larger panels can be purchased as a kit and include a charge controller and the necessary wires and connectors; all you need to add is an inverter, mini-electrical panel, and a 12V storage battery or two. 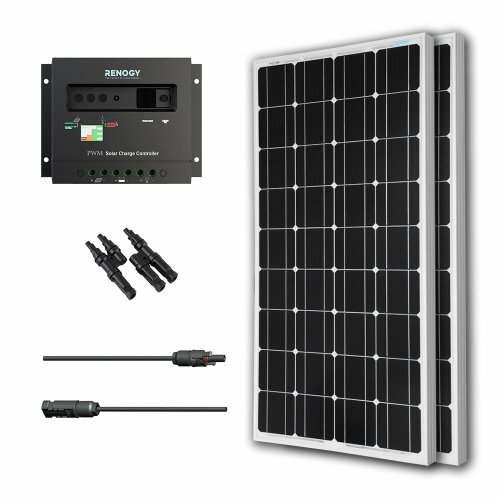 The system I’d begin with would be the Renogy 200 Watt 12 Volt Monocrystalline Solar Bundle Kit with Wanderer. Using this type of system you can wire your shed with receptacles and fixtures. It will be able to power numerous indoor and outdoor LED lights as they don’t use much electricity. The amount of direct sunlight a solar panel receives affects the amount of charge your batteries will get. The sun rises in the east and sets in the west, so in the northern hemisphere, the panel should face south. It may also need an orientation east or west depending on the landscape to maximize exposure to the sun; the more southern the exposure, the better. If you live north of the 40th parallel, to optimize solar charging, angle the face of the panel to the horizon (level ground) between 50 to 65 degrees in the summer and between 15 to 20 degrees in the winter. The angles change the closer to the equator you live. The more perpendicular the panel is to the sun’s path at noon, the more electricity it will generate. Integrated panels are often pre-set at 45 degrees and work best if facing true south. The angle is good for most of North America in the summer months but means poor charging during winter months. It should never face north unless you live south of the equator. Separated solar panels are more flexible than integrated models. They allow the light fixture to be placed where needed, and the panel placed elsewhere to maximize solar conversion. It’s up to you if you want to change the panel angle every 6 months. Shade can affect solar electric generation dramatically, as can snow and dirt. A little shade can reduce output by 50%, and complete shade up to 100%. The clearer the exposure of the panel to the sun, the more electricity it will produce. A DIY solar shed light system is similar to the shed solar light kit system, but instead, you purchase or scrounge the components separately. Make sure you have someone knowledgeable in solar electrical installations check your plan and work. A 10-watt photovoltaic solar panel is the smallest you want for your system – the bigger, the better if you can. Build a frame or mount it on the roof, so it faces south and slants at 45-degrees to the horizon. Find or purchase a 16A or larger charge controller and an old car battery or working cordless power tool battery. The old car battery may not start your car, but it will hold enough of a charge for LED lights. Connect the panel to the correct controller ports and the battery to the other ports on the controller. From the battery, connect to an inverter, to which you can run a circuit for LED fixtures or other small appliance. Ensure the panel faces a southerly direction. Make sure the panel has full exposure to the sun; no trees or building shadows. Locate solar light with motion sensors parallel to what it is to illuminate. If planning to use the light during daylight hours, get one without a photocell or light sensor. The more lumens, or lux, the brighter the light. The more milliampere-hours (mAh) a battery has, the more solar power it can store, and hopefully, the longer it can power a light. Solar panels use the sun’s light to make electricity. Light bulbs mimic the sun’s light spectrum on a small scale so they can be used to charge a battery through a small panel – a solar calculator is a good example. However, the larger the panel and charge required, the greater the light required. Solar panels work by converting the sun’s light into electricity. On a cloudy day, we still get sunlight, or it wouldn’t be day-time. The panel will still produce 30% to 50% of its full sun output depending on the density of the clouds. Solar panel material should last 100+ years and produce electricity throughout its life. Unfortunately, due to manufacturing and quality issues, plus the effect of corrosive materials we’ve pumped into the air, 20 to 25 years is a reasonable guesstimate. Additionally, it’s estimated that a panel’s efficiency decreases between 0.3% and 1% per year depending on quality and type. Most quality panels come with a guarantee that they will still produce 80% of their rated power after 20 or 25 years. Keeping the panel clean and protecting it from scratches will also extend its efficiency. There are solar panels from the 1970s that are still producing at 80% efficiency too. However, the flexible film type panels are only guaranteed for 2 to 5 years. Choosing solar light fixtures can be a cost-saving factor for your wallet. Understanding how they work, where to place them, and what type is best for your needs are essential factors in your decision. Hopefully, this article has provided you with the information to make an informed choice. If you found this article beneficial, let us know. If you know someone who might find this article helpful, pass it on. Your comments are appreciated too.